Numerical modeling of heat and mass transfer during forced convection drying. ABDALLA, I. E., COOK, M. J. & HUNT, G. R. 2009. Numerical Study of Thermal Plume Characteristics and Entrainment in an Enclosure with a Point Heat Source. Engineering Applications of Computational Fluid Mechanics, 3, 608-630. ASHOK KUMAR, M. & PRASAD, V. S. S. S. 2009. Computational Investigations of Flow and Heat Transfer on an Effused Concave Surface with a Single Row of Impinging Jets for Different Exit Configurations. Engineering Applications of Computational Fluid Mechanics, 3, 530-542. BAKKAS, M., HASNAOUI, M. & AMAHMID, A. 2010. Natural convective flows in a horizontal channel provided with heating isothermal blocks: Effect of the inter blocks spacing. Energy Conversion and Management, 51, 296-304. BOULET, M., MARCOS, B., DOSTIE, M. & MORESOLI, C. 2010. CFD modeling of heat transfer and flow field in a bakery pilot oven. Journal of Food Engineering, 97, 393-402. CHANTELOUP, V. & MIRADE, P.-S. 2009. Computational fluid dynamics (CFD) modelling of local mean age of air distribution in forced-ventilation food plants. Journal of Food Engineering, 90, 90-103. CHATTERJEE, D., BISWAS, G. & AMIROUDINE, S. 2010. Numerical simulation of flow past row of square cylinders for various separation ratios. Computers & Fluids, 39, 49-59. CROCE, G., DE CANDIDO, E. & D'AGARO, P. 2009. Numerical modelling of heat and mass transfer in finned dehumidifier. Applied Thermal Engineering, 29, 1366-1374. DELELE, M. A., SCHENK, A., RAMON, H., NICOLAÏ, B. M. & VERBOVEN, P. 2009. Evaluation of a chicory root cold store humidification system using computational fluid dynamics. Journal of Food Engineering, 94, 110-121. DELELE, M. A., SCHENK, A., TIJSKENS, E., RAMON, H., NICOLAÏ, B. M. & VERBOVEN, P. 2009. Optimization of the humidification of cold stores by pressurized water atomizers based on a multiscale CFD model. Journal of Food Engineering, 91, 228-239. ENDALEW, A. M., HERTOG, M., DELELE, M. A., BAETENS, K., PERSOONS, T., BAELMANS, M., RAMON, H., NICOLAÏ, B. M. & VERBOVEN, P. 2009. CFD modelling and wind tunnel validation of airflow through plant canopies using 3D canopy architecture. International Journal of Heat and Fluid Flow, 30, 356-368. FERRUA, M. J. & SINGH, R. P. 2009. Design guidelines for the forced-air cooling process of strawberries. International Journal of Refrigeration, 32, 1932-1943. FERRUA, M. J. & SINGH, R. P. 2009. Modeling the forced-air cooling process of fresh strawberry packages, Part I: Numerical model. International Journal of Refrigeration, 32, 335-348. FERRUA, M. J. & SINGH, R. P. 2009. Modeling the forced-air cooling process of fresh strawberry packages, Part II: Experimental validation of the flow model. International Journal of Refrigeration, 32, 349-358. FERRUA, M. J. & SINGH, R. P. 2009. Modeling the forced-air cooling process of fresh strawberry packages, Part III: Experimental validation of the energy model. International Journal of Refrigeration, 32, 359-368. GUERROUDJ, N. & KAHALERRAS, H. 2010. Mixed convection in a channel provided with heated porous blocks of various shapes. Energy Conversion and Management, 51, 505-517. HAN, J.-H., KWON, H.-J., YOON, J.-Y., KIM, K., NAM, S.-W. & SON, J. E. 2009. Analysis of the thermal environment in a mushroom house using sensible heat balance and 3-D computational fluid dynamics. Biosystems Engineering, 104, 417-424. ICIEK, J. & KRYSIAK, W. 2009. Effect of Air Parameters on the Quality of Dried Potato Cubes. Drying Technology: An International Journal, 27, 1316 - 1324. KAYA, A., AYDIN, O. & DEMIRTAS, C. 2009. Experimental and theoretical analysis of drying carrots. Desalination, 237, 285-295. KLIMANEK, A. & BIAECKI, R. A. 2009. Solution of heat and mass transfer in counterflow wet-cooling tower fills. International Communications in Heat and Mass Transfer, 36, 547-553. LAMNATOU, C., PAPANICOLAOU, E., BELESSIOTIS, V. & KYRIAKIS, N. 2009. Conjugate Heat and Mass Transfer from a Drying Rectangular Cylinder in Confined Air Flow. Numerical Heat Transfer, Part A: Applications: An International Journal of Computation and Methodology, 56, 379-405. LARIANI, A., NESREDDINE, H. & GALANIS, N. 2009. Numerical and experimental study of 3D turbulent airflow in a full scale heated ventilated room. Engineering Applications of Computational Fluid Mechanics, 3, 1-14. MORAGA, N. O., RIQUELME, J. A. & JAURIAT, L. A. 2009. Unsteady conjugate water/air mixed convection in a square cavity. International Journal of Heat and Mass Transfer, 52, 5512-5524. MOUREH, J., LETANG, G., PALVADEAU, B. & BOISSON, H. 2009. Numerical and experimental investigations on the use of mist flow process in refrigerated display cabinets. International Journal of Refrigeration, 32, 203-219. MOUREH, J., TAPSOBA, M. & FLICK, D. 2009. Airflow in a slot-ventilated enclosure partially filled with porous boxes: Part I - Measurements and simulations in the clear region. Computers & Fluids, 38, 194-205. MOUREH, J., TAPSOBA, M. & FLICK, D. 2009. Airflow in a slot-ventilated enclosure partially filled with porous boxes: Part II - Measurements and simulations within porous boxes. Computers & Fluids, 38, 206-220. MOUREH, J., TAPSOBA, S., DERENS, E. & FLICK, D. 2009. Air velocity characteristics within vented pallets loaded in a refrigerated vehicle with and without air ducts. International Journal of Refrigeration, 32, 220-234. NAGHAVI, Z., MOHEB, A. & ZIAEI-RAD, S. 2010. Numerical simulation of rough rice drying in a deep-bed dryer using non-equilibrium model. Energy Conversion and Management, 51, 258-264. PAGE, J.-F. L., CHEVARIN, C., KONDJOYAN, A., DAUDIN, J.-D. & MIRADE, P.-S. 2009. Development of an approximate empirical-CFD model estimating coupled heat and water transfers of stacked food products placed in airflow. Journal of Food Engineering, 92, 208-216. SHAO, S. 2010. Incompressible SPH flow model for wave interactions with porous media. Coastal Engineering, 57, 304-316. SMOLKA, J., NOWAK, A. J. & RYBARZ, D. 2010. Improved 3-D temperature uniformity in a laboratory drying oven based on experimentally validated CFD computations. Journal of Food Engineering, 97, 373-383. STEEMAN, H. J., JANSSENS, A., CARMELIET, J. & DE PAEPE, M. 2009. Modelling indoor air and hygrothermal wall interaction in building simulation: Comparison between CFD and a well-mixed zonal model. Building and Environment, 44, 572-583. STEEMAN, H. J., JANSSENS, A. & DE PAEPE, M. 2009. On the applicability of the heat and mass transfer analogy in indoor air flows. International Journal of Heat and Mass Transfer, 52, 1431-1442. STEEMAN, H. J., T'JOEN, C., VAN BELLEGHEM, M., JANSSENS, A. & DE PAEPE, M. 2009. Evaluation of the different definitions of the convective mass transfer coefficient for water evaporation into air. International Journal of Heat and Mass Transfer, 52, 3757-3766. STEEMAN, H. J., VAN BELLEGHEM, M., JANSSENS, A. & DE PAEPE, M. 2009. Coupled simulation of heat and moisture transport in air and porous materials for the assessment of moisture related damage. Building and Environment, 44, 2176-2184. TEITEL, M., DVORKIN, D., HAIM, Y., TANNY, J. & SEGINER, I. 2009. Comparison of measured and simulated flow through screens: Effects of screen inclination and porosity. Biosystems Engineering, 104, 404-416. TERUEL, F. E. & RIZWAN, U. 2009. 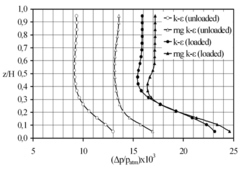 Characterization of a porous medium employing numerical tools: Permeability and pressure-drop from Darcy to turbulence. International Journal of Heat and Mass Transfer, 52, 5878-5888. TERUEL, F. E. & RIZWAN, U. 2009. A new turbulence model for porous media flows. Part I: Constitutive equations and model closure. International Journal of Heat and Mass Transfer, 52, 4264-4272. TERUEL, F. E. & RIZWAN, U. 2009. A new turbulence model for porous media flows. Part II: Analysis and validation using microscopic simulations. International Journal of Heat and Mass Transfer, 52, 5193-5203. TUTAR, M., ERDOGDU, F. & TOKA, B. 2009. Computational modeling of airflow patterns and heat transfer prediction through stacked layers' products in a vented box during cooling. International Journal of Refrigeration, 32, 295-306. VAN BUGGENHOUT, S., VAN BRECHT, A., EREN ÖZCAN, S., VRANKEN, E., VAN MALCOT, W. & BERCKMANS, D. 2009. Influence of sampling positions on accuracy of tracer gas measurements in ventilated spaces. Biosystems Engineering, 104, 216-223. VAN MOURIK, S., ZWART, H. & KEESMAN, K. J. 2009. Integrated open loop control and design of a food storage room. Biosystems Engineering, 104, 493-502. VELAZQUEZ, A., ARIAS, J. R. & MONTANES, J. L. 2009. Pulsating flow and convective heat transfer in a cavity with inlet and outlet sections. International Journal of Heat and Mass Transfer, 52, 647-654. VIDAL, D., ROY, R. & BERTRAND, F. 2010. On improving the performance of large parallel lattice Boltzmann flow simulations in heterogeneous porous media. Computers & Fluids, 39, 324-337. WU, J. M., HUANG, X. & ZHANG, H. 2009. Theoretical analysis on heat and mass transfer in a direct evaporative cooler. Applied Thermal Engineering, 29, 980-984. YE, Z., SAHA, C. K., LI, B., TONG, G., WANG, C., ZHU, S. & ZHANG, G. 2009. Effect of environmental deflector and curtain on air exchange rate in slurry pit in a model pig house. Biosystems Engineering, 104, 522-533. YE, Z., ZHANG, G., SEO, I. H., KAI, P., SAHA, C. K., WANG, C. & LI, B. 2009. Airflow characteristics at the surface of manure in a storage pit affected by ventilation rate, floor slat opening, and headspace height. Biosystems Engineering, 104, 97-105. ZHANG, M.-L., LI, C. W. & SHEN, Y.-M. 2010. A 3D non-linear k-[epsilon] turbulent model for prediction of flow and mass transport in channel with vegetation. Applied Mathematical Modelling, 34, 1021-1031.